After I got over my initial shock and excitement, I said, “Better yet, I have the real song, a record album. I’ll bring it in on Monday.” And I did. You could have heard a pin drop as I pulled the record out of the album cover with fifteen saucer eyes staring at what was happening. It was wonderful. 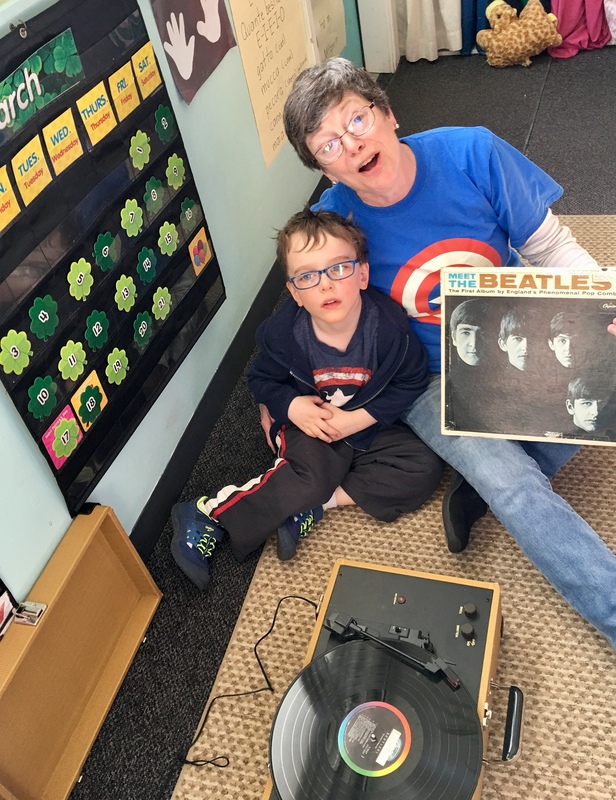 This entry was posted in Early Education, Expressing words and feelings, Inspiration, joy, music, preschool, The Arts, The Beatles and tagged Early Education, music, record albums, record player, Teaching moments, teaching young children, The Beatles. Bookmark the permalink. Definitely the best job, Jennie. Magic happens! That is so cool that he wanted to hear this song. No doubt he heard it from his parents or more likely his grandparents. A bit of history. It is a great song and timeless. You do have a fabulous job! Those children are going to look back at their time with you with such fondness, it will bring a tear to their adult eyes. You will live forever in their memories, Jennie. I for one cannot imagine any better legacy. My sentiments exactly–and very well-put! I hope so, Pete. And yes, it is the greatest legacy. Best to you! I’d trade jobs with you, except it wouldn’t be fair to the children. They deserve the best. That’s not a job – that’s a pleasure! I’m so glad you noticed that, Opher. I wasn’t sure about using the word ‘job’, because it isn’t a job when those many wonderful moments happen. Thank you, Carol. Music sticks. And, it leaves one of those ‘time and place’ memories. I remember my fifth grade teacher because of the music she taught us. If some of the children I teach move forward and build skills with memories of music, that’s a good thing. Yes, indeed! Thank you, Carol. This year, one of my Reception pupils wanted Black Betty played at our Christmas party! We have an Easter disco next week… He’s already asked for it as a request! As long as the DJ is willing! Now, that’s my kind of pupil, bam-ba-lam! this is absolutely amazing jennie, on so many levels! the whole record and record player thing in itself is magic, but music, and giving them the experience and love of music is a gift. i am a teacher too, and it is impossible to have a bad day. I can imagine showing a child something as antique as a record player must have been amazing. I think you are right. The best job ever. It was amazing, John. I wish you could have been a fly on the wall. Those moments make it the best job ever. What a great time in teaching! Growing up loving music is SO important! I so love this. Yes, it is beyond words when a child remembers a particular song, or they are trying to express an emotion through a song they have heard. This little fellow has a wonderful and exceptional relationship with you and it is his way of telling you how much you mean to him as a hero and person who he can look up to for his learning and guidance. What a grand thing to read! I’m so glad you loved this, Anne. Music and art and reading make the biggest impact on children. And when a child remembers a song, piercing the heart has begun. That in itself is a tremendous thing, and the foundation for goodness and learning starts to flow. Having a hand in some of that is very special. And that little guy is very special. Thank you, Anne. Jennie, this is so wonderful! Thank you, Charles. It was wonderful. I wish you could have been a fly on the wall! “This is as good as it gets” … truer words were never spoken. Awesome job! I had not thought about it, but I imagine at least half the kids that age have never seen a record player, at least not in action! I think you are absolutely right! Thank you, Jill. I can attest to the magic, Marlene. It’s a wonderful thing to witness. Thank you so much! I am thrilled that this young boy wants to hear a song from that era in the 60s. That is incredible and yes, not only is it a great job, but you do it better than anyone else. It is so wonderful for the children and what they are learning to love: music, art, reading, and writing…and most importantly, learning to love the fine arts in humanity. I was thrilled, too! And stunned. What a moment to seize! The arts are precious, especially for children. They are learning to love what is most important. Thank you, Karen! 1965, Okinawa. I am five years old, living in a mint-green, two story apartment that served as quarters on the military post where my dad was stationed. In the apartment above: Sherry — a 20-something young woman with her short blonde hair in tight curls around her head, wearing a red mini-dress and white plastic go-go boots, dancing The Jerk as she came down the stairs to The Beatles’ I Want To Hold Your Hand… absolutely HORRIFYING my Midwest conservative Mom! I LOVE YOU, SHERRY! NO MATTER WHERE YOU ARE…. Did your mother talk to my mother? I wanted go-go boots and was not allowed them! They must have talked to one another! And the low cut bell bottom pants with a wide white plastic belt. Remember? I didn’t have that one, either. Yes, I remember casting very envious eyes on the girls who were fortunate to wear them. This is such a wonderful story that I could cry for joy. How happy you all must have been. Thank you, Miriam! I’m so glad it filled you with joy. We all need joy. Yes, we were very happy.! I can feel those vibes. And, what a beautiful feeling! Oh, they must have been thrilled! I can still remember when my homeroom teacher played a new song called “You’ve Got a Friend” on her crystal-clear record player. They were so thrilled! What a great memory for you, Marcia! That record player makes a huge impact. They thought the record was a giant CD. It was so much fun, Diana! Here is another excellent post from the wonderful teacher, Jennie! What lovely times you have with the children, Jennie. It was wonderful, Robbie. Thank you. The Beatles are a classic. Can you play music in the background during your pottery classes? That might open a door. I was so surprised that the child knew the song. So now, a whole class of preschoolers knows the Beatles. Yes!! Please let me know how it goes, Sarah! I can’t disagree with you, not one bit. Thank you, Michael! Happy weekend to you. WordPress is, as often happens, not allowing me to like this post… but I do… what a wonderful story – I bet that little boy is so thrilled. He was so thrilled that his parents gave our classroom a book which is the words and illustrations to the Beatles the song “All You Need is Love”. I’ll read it to him this morning! Thank you! Headed over here, via Marlene’s blog. You sound like a wonderful teacher. Looking forward to reading more of your posts.